Apart from face brick’s role in thermal efficiency, noise insulation and fire resistance, it also adds aesthetic value to a building. This is why 53 000 of Corobrik’s Firelight Satin face bricks were selected by the owners of a 984m², three-storey, five-bedroom home in Eldo Ridge Estate, Eldoraigne, Pretoria. The 984m² premises was designed by SNAPP Architects, who set about creating a modern home that incorporated intimate, private spaces amid public entertainment areas while taking full advantage of the extensive views offered by the site. According to SNAPP Architects, the Firelight Satin face bricks were selected in conjunction with the client because of the smooth, uniform finish which perfectly complements the aesthetic of the building, as well as the earthy richness of the colour. In addition, the use of face brick and off-shutter concrete for large portions of the building reduced the amount of exterior maintenance and up-keep required for the home, which is hugely beneficial in the long run. The face bricks were used throughout to ground the building in its natural context. Every opportunity was taken to open the house up with large glazed areas and roofs pitched to allow maximum light and views. However, where containment and intimacy were required, round forms were inserted into the rectilinear plan to provide relief and enhance the individuality of the building. All the curved elements were built using face brick. This includes the study, staircase, exterior fire pit enclosure, braai area and ablutions. The arc of the walls contributes to the flow of spaces within the house while adding complexity and appeal to the exterior aesthetic. The face-brick material enhances the juxtaposition of clean lines and hard materials against organic forms and natural brick textures. The bricks were laid in a header bond pattern where the curves became too tight to use a standard stretcher bond. This pattern allowed for smaller increments of angle change between each brick and thus a smoother look to the curve. The walls were then topped with a roller course in matching brickwork in order not to break the feel of a solid brick form with the use of alternative coping materials. 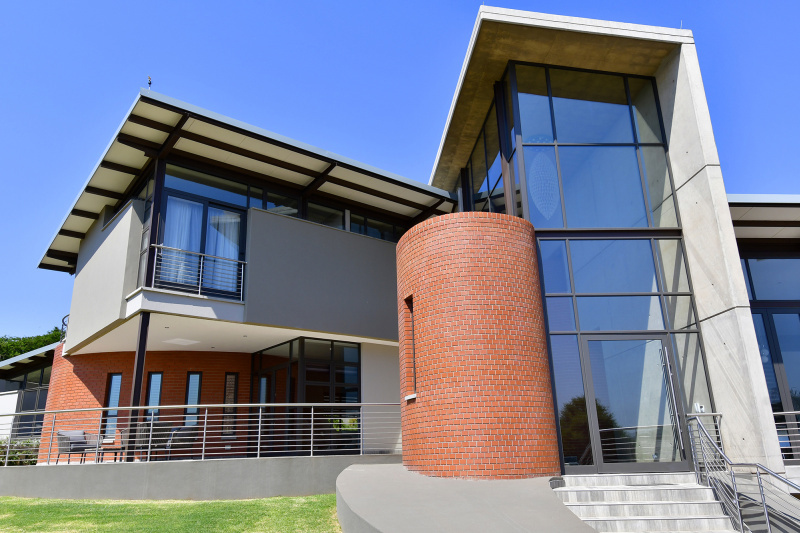 Impressed with the final outcome, the owner lauded the quality of the brickwork and other elements of the building as well as the experience and perfectionist attention to detail of the building contractor, NGA Construction. Caption main image: The exterior of this home has been constructed using Firelight Satin clay face bricks, which highlight the concrete, glass and aluminium.